1. Lay baguette slices on parchment paper or foil-lined baking sheet. Brush with 1 tbsp (15 mL) olive oil and sprinkle with half of the salt; flip and repeat. Broil for 2 to 3 minutes, flipping halfway through, until lightly toasted. Let cool. 2. Heat remaining oil in large skillet set over medium heat. Add apple slices, balsamic vinegar, half of the thyme, and brown sugar. Cook for 6 to 8 minutes or until apples are tender and glazed. 3. 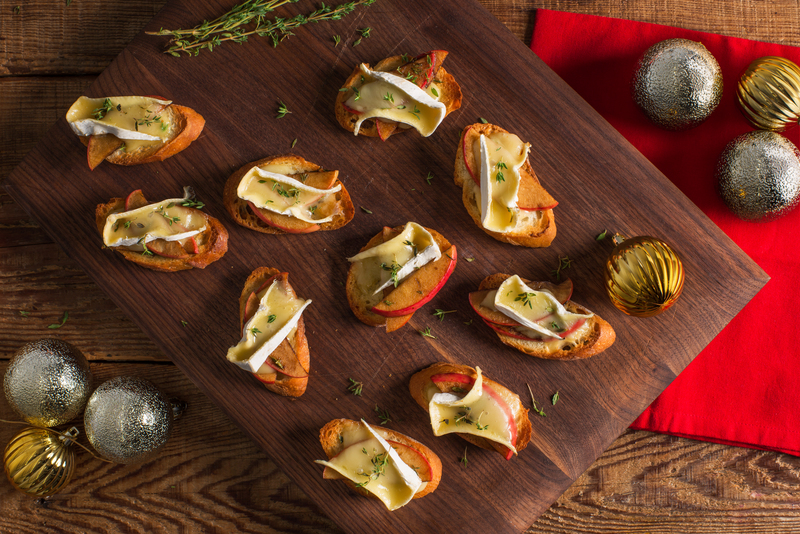 Top toasted baguette slices evenly with Brie and apples. Broil for 1 to 2 minutes or until cheese is melted. Sprinkle with remaining thyme. 4. Arrange crostini in circle to resemble wreath. Garnish with rosemary sprigs and/or pomegranate seeds (if using). – Toast baguette slices a day ahead and store in airtight container. – Make apple mixture a day ahead and refrigerate in airtight container. Warm briefly in the microwave before serving. – Choose tart apples, such as Granny Smith, or sweet apples, such as McIntosh or Royal Gala, depending on your preference.